Whether you prefer the traditional beer battered cod with soft fluffy chips, creamy fish pie with crispy potato topping, or a simple white fillet with new potatoes, the best fish recipes don’t hide the fresh flavour of this delicious alternative to meat. Be adventurous with new and simple fish recipes! Have you tried succulent monk fish as an alternative to beef, chicken or lamb in your homemade curry? Learning to cook healthy fish recipes is often so simple it becomes effortless. Almost 160 years ago, in the 1860s, a wondrous culinary fusion occurred. Battered fish met potato chips. Fish and chips was born! But the history of fish and potato being baked together goes back further throughout history. From fresh oysters eaten down at the docks to just-caught cod, haddock and pollock shipped straight to city markets across the world. Fish and seafood in general are a part of our heritage. Let’s not forget the wide range of fishes available for us to turn into simple fish recipes! Simple sardines, fried in butter and garlic, served on toast. An old-fashioned breakfast treat. Or perhaps your tastes are more inclined to more elaborate baked fish recipes? 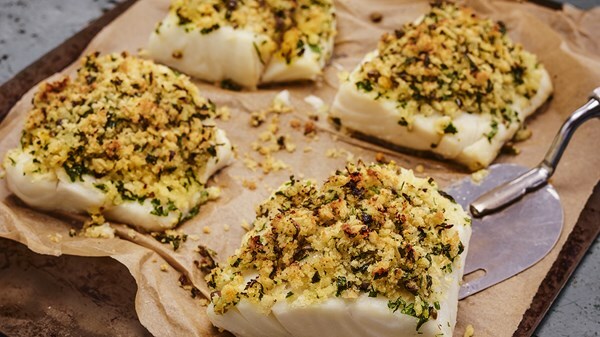 Try white halibut fillets baked in the oven with a simple lemon herb crust. That combination of soft, flaky fish with the crunch of well-seasoned breadcrumbs is divine. Butter is often an essential component of fried and baked fish recipes. Even the simple fish recipes of a single fillet and boiled new potatoes wouldn’t be complete without that golden square of melting butter and a sprinkling of dill. White sauces (and a generous glass of white wine) are the traditional accompaniment for a fish dish. If you’re in a rush but still want to cook up a delicious fish dinner for yourself and your family, simply melt butter in a pan (salted or unsalted, depending on your tastes) and add lemon juice, lemon zest, dill, tarragon, parsley or any other fresh herbs you have around. A simple butter sauce livens up any white fish! Our caper and parsley crusted cod recipe combines beautifully tender cod fillets with a crunchy loaded breadcrumb topping and glossy butter lemon sauce. A fantastic way to mix up your usual fish n’ chips Friday! One of our favourite baked fish recipes is this salmon recipe. 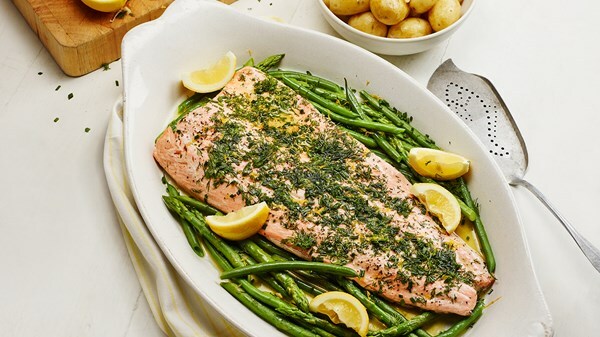 You don’t need to be an aspiring chef to turn a simple salmon into a mouth-watering meal with our baked herb salmon fish recipe. Dripping with flavour and best served with fresh greens and a squeeze of lemon juice. We love trying something new! Take your taste buds on an adventure with our roasted sea bream with fennel and chilli recipe. The Mediterranean style recipe uses fiery chillies, refreshing dill and luxurious white wine to create a complex flavour to enjoy with buttery new potatoes and contrastingly bitter salad. Try this recipe at dinner parties! Do you have any questions or thoughts?